I Zwift in the winter because, admittedly, I hate riding in the cold. I Zwift on “I’m-late-coming-home-from-work-and-the-puppy-needs-some-quality-bonding-time” days. I Zwift when I feel like maybe – just maybe – I’ve gone out to dinner too many times this week and it’s pitch-black outside and I need to get some kind of spinning done. Quite frankly, Zwift is the all-purpose, need-to-get-on-the-bike solution. In a nutshell – and terribly oversimplified – Zwift is a combination of an MMORPG (“massively multiplayer online role-playing game”), at-home fitness program, trainer program, and spin class. 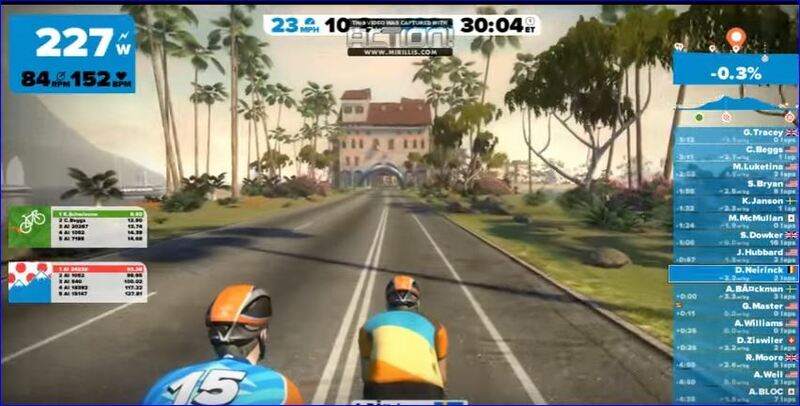 You (and your bike on the trainer) are turned into an avatar which can then ride, train, or compete in a virtual world of various courses (London, anyone?). Each workout you complete or ride you finish earns you points to be used to unlock new kits, new bikes, and new prizes. There are virtual teams and races, various training programs (including race and time trial preparation), and an in-game (or would that be “on-bike”) group chat feature. You can login to ride or just watch and give riders kudos as they go by. On course Strava segments make it even more competitive and with every workout, Zwift will measure your PSE (Pizza Slices Earned). Sound fun? It is! And, best of all, it allows you to ride any time – night or day – with people from around the world. One morning, none other than Jens Voight blew by me on the Watopia course. (And, yes, it was Jensie – he is a well-known visitor to the Zwift courses and often posts about his Zwift workouts). The cost of the program is $10 (for the base subscription) and you’ll need a few things for the set up (a cadence sensor, an ANT dongle, and an internet connection), but it’s a fun and a great opportunity to get on the bike when you may not have an opportunity to do so otherwise. If you’re anything like me, a program that makes using the trainer fun AND competitive is most definitely a plus! Editor’s Note: The author’s views are in no way an endorsement of the Club of this exercise program. No money has been given by Zwift to the author in exchange for this review. No pizza, either.